I often get asked what I think of the POSE method & thought it time to take the risk of putting my thoughts out there. Let me start by saying that I have not done a full, in-depth study of his teachings. I have studied the video & written materials available, as well as the research project. I have worked with many athletes that have followed his courses & teachings & can recognize a runner using his methodology. I know Nicolas Romanov & consider him an acquaintance. He is a very well-informed, scientifically-minded, interesting individual with a true passion for helping runners. We have had some fun conversations in which we have more celebrated the similarities of our work than argued the differences. We both strongly feel that most runners would do well to formally work on their run mechanics & that drills for specific strengthening & habituation are essential to achieve running excellence commensurate with fitness. We have debated the merits of his method versus my take (approach) to effective running mechanics at last year’s USAT National Bi Annual Art & Science festival on the merits of his system & my approach. The study showed that the POSE method reduces pressure around the knee. An observation of the participants of that study also showed that a large percentage of them developed achilles & soleus injuries possibly due to transitioning from heel to mid/fore foot striking. I think his strengthening & plyometric exercises are excellent, but that the conditioning phasing needs to be very much longer for the average athlete – in fact it should take years, rather than only weeks. The exercises may also need to be graded, as some are so advanced as to pose the risk of serious injury to the less skilled & conditioned athlete. I fully agree with the forward lean & the concept of going from one pose on the left leg to the same pose on the right leg. Closed loop, reflex actions need a starting point to begin the work of effective correction if required. Running being cyclical makes it hard to intellectualize as well as teach from a static perspective. Let’s get down to the points where I disagree. Please note that I have always felt that what Nicolas demonstrates versus what he says/teaches in explanation of what he is doing is contradictory. What he is doing looks right, how he explains it does not. Also bear in mind that running involves so much eccentric loading & unloading & an elastic return to power ratio on 5 to 1, that is exceedingly hard to measure what is truly concentrically contracting & what has eccentrically loaded & is "passively" unloading, so both he & I speak empirically to some degree. Hopefully my ideas are an accurate summation of what pressure plate & other testing (like measuring muscle contraction & high speed videography) have shown. Nicolas feels all runners should run on their forefoot – I disagree, many people do not have the strength, conditioning, mechanics or structure to safely do so. Transitioning a runner is slow, pain staking, risky & sometimes not possible. 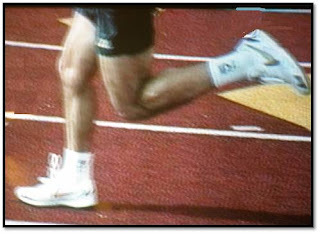 Some of the greatest runners on earth are heel strikers or full foot strikers. Correct forefoot running may be faster, “softer” & more powerful, but demands high degrees of resilience, specific strength & conditioning. Heavier runners beware. Nicolas believes that this “falling” from one pose to the next is set up by the forward lean & the concentric firing of the hamstring & in so doing raising the heel up to the hips/glutes. I disagree most strongly here, as the loading, eccentrically & elastically of the hip flexors (especially the iliopsoas) through the downward (& rearward, because of momentum) thrust of the leg through glute & quad extension causes the knee to snap elastically forward (the psoas does not actively contract, but controls the release speed). The knee folds in this process (sheer physics) of the knee being snapped forward by the releasing hip flexors, bringing the heel towards the hips to shorten the lever (& taking the shortest route, like the tip of a cracked whip). The hamstring's job is to eccentrically decelerate the lower leg from this point so as not to flip out forward & allow the knee to lock while still air born. This would lead to an excessive braking phase as the foot contacts the surface too far ahead of the dynamic center of mass. There has to be a braking point, but the runner must attempt to reduce this to the minimum – sufficient only to stop them from face planting! A characteristic of great runners is this minimized breaking effect. By lifting the heel up & falling a float phase is set up, which robs the runner of stride rate, a key determinant of successful running. By lifting the heel towards the glutes elastic propulsion is compromised & the main mass of the body is not propelled forward. That's why, in my opinion, when Nicolas, or one of his converts runs they seem to have too much range of motion with too much muscular work for the speed they are generating - they look inefficient; like they are using too much energy for the level of propulsion they are achieving. I end off by saying that this is my interpretation of what Nicolas is teaching with the POSE method – I may very well be wrong in my assessment. In my 28 years of coaching I have come to a point where I want to help every level of runner achieve a running style or form that allows them to run as fast as their physiology will allow them, to run as far as they need to in order to achieve the desired training effect & not become injured in that process. Instead of teaching one method to every runner, I take what the runner brings & try to work with this, creating the best possible running scenario for them, given their specific physical idiosyncrasies as they pertain to their running mechanics. I try not to make them "mugus", a South African term for a square peg in a round hole! I never studied the POSE method, but I agree with Bobby: it probably won't work for everyone, and can definitely hurt. Last winter, after reading some articles about getting forward while running, I decided to accomplish this by moving more forward onto the balls of my feet. An unfortunate decision for me. I was in good shape and and fairly strong, but the change of stride was just too much pressure on my calves--in the first 10K of the season, I tore a left calf muscle at mile 2. Not realizing I had such a serious injury and where it came from, I only took a couple of weeks off. I continued to train and race (with discomfort) and still focused on that forefoot strike. Sure enough, I re-injured myself--a few times. (I said I was in good shape, not smart!!) When I finally had an MRI, I had serious tears in two separate calf muscles and I had to give up running for the season to heal. When I began to train again the following winter, I felt an ominous tightness in both calves after each run. After consulting a chiropractor specializing in run technique, I went back to my natural running style--landing on my heel to mid-foot. My calves feel normal after each run, and I haven't had a problem since.